A riot of immersive entertainment, live music and DJ sets from Anna Prior of Metronomy in honour of Valentine's Day. With live music from punk-witch, riot gurrl band Dream Nails, this is a night of sass in the Vaults to celebrating all forms of love. Join Shotgun Carousel, skilled creators of immersive events, in the Leake Street tunnels for a night of multi-coloured, bio-glittered chaos. 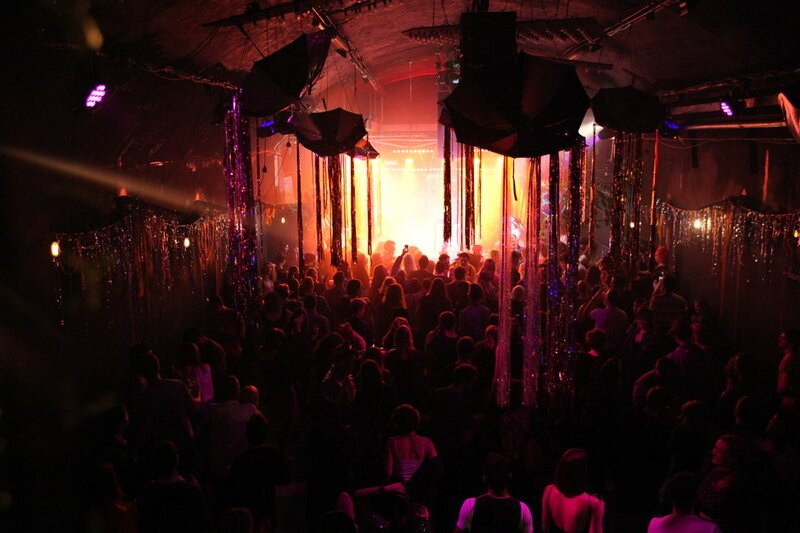 As part of the late night programme at the Vault Festival there's something going on every Saturday night - from silent disco to soul train - but Saturday 16th February is dedicated to love in all its guises, from sweet nothings to filthy love bites. Dress code: kitsch (and ideally 80s). HotelMap for Eat Your Heart Out! Stations near Eat Your Heart Out! Parking near Eat Your Heart Out! Hotels near Eat Your Heart Out! Near Eat Your Heart Out! 1 Addington Street, SE1 | 1 minute from Eat Your Heart Out! Westminster Bridge Road, SE1 | 2 minutes from Eat Your Heart Out! 6 Hercules Road, SE1 | 5 minutes from Eat Your Heart Out! Events near Eat Your Heart Out! Eat Your Heart Out!, Jubilee Gardens, Belvedere Road, SE1 | 5 minutes from Eat Your Heart Out! Eat Your Heart Out!, Belvedere Road, SE1 | 5 minutes from Eat Your Heart Out! Entertainment near Eat Your Heart Out! 10 Leake Street, South Bank, London SE1 | Same location as Eat Your Heart Out! County Hall, 5 Chicheley Street, South Bank, London SE1 | 1 minute from Eat Your Heart Out! 1 Launcelot Street, SE1 | 3 minutes from Eat Your Heart Out! Sights and Attractions near Eat Your Heart Out! The best museums, galleries, attractions near Eat Your Heart Out! Riverside Building, County Hall, Westminster Bridge Road, Bankside, London SE1 | 3 minutes from Eat Your Heart Out! County Hall, Westminster Bridge Road, South Bank, London SE1 | 3 minutes from Eat Your Heart Out! Riverside Building, County Hall, Westminster Bridge Road, South Bank, London SE1 | 3 minutes from Eat Your Heart Out! Shopping near Eat Your Heart Out! The best shops and markets near Eat Your Heart Out! 119-120 Lower Marsh, South Bank, London SE1 | 3 minutes from Eat Your Heart Out! 27 Lower Marsh, South Bank, London SE1 | 3 minutes from Eat Your Heart Out! Lower Marsh, South Bank, London SE1 | 4 minutes from Eat Your Heart Out! Restaurants near Eat Your Heart Out! What are the best dining options near Eat Your Heart Out! London? County Hall, Belvedere Road, South Bank, London SE1 | 2 minutes from Eat Your Heart Out! 200 Westminster Bridge Road, South Bank, London SE1 | 2 minutes from Eat Your Heart Out! First Floor, Park Plaza Westminster Bridge, South Bank, London SE1 | 2 minutes from Eat Your Heart Out! Restaurant deals near Eat Your Heart Out! Education near Eat Your Heart Out! Somerset House, Covent Garden, London WC2R | 12 minutes from Eat Your Heart Out! Elephant & Castle, Elephant and Castle, London SE1 | 16 minutes from Eat Your Heart Out! 1 Sheffield Street, Holborn, London WC2A | 17 minutes from Eat Your Heart Out! Leisure near Eat Your Heart Out! Eat Your Heart Out! gyms, sporting activities, health & beauty and fitness. Westminster Bridge Road, South Bank, London SE1 | 3 minutes from Eat Your Heart Out! 3 Belvedere Road, South Bank, South Bank, London SE1 | 3 minutes from Eat Your Heart Out! Lower Marsh, SE1 | 4 minutes from Eat Your Heart Out! Pubs near Eat Your Heart Out! The best pubs near London Eat Your Heart Out!. 25 Roupell Street, South Bank, London SE1 | 6 minutes from Eat Your Heart Out! 36 The Cut, South Bank, London SE1 | 8 minutes from Eat Your Heart Out! 48 Parliament Street, Whitehall, Westminster, London SW1A | 8 minutes from Eat Your Heart Out! Nightlife near Eat Your Heart Out! Eat Your Heart Out! clubs, bars, cabaret nights, casinos and interesting nightlife. Rooftop, Mercury House, 109-117 Waterloo Road, SE1 | 5 minutes from Eat Your Heart Out! Belvedere Road, South Bank, London SE1 | 5 minutes from Eat Your Heart Out! Corinthia Hotel London, Whitehall Place, Westminster, London SW1A | 9 minutes from Eat Your Heart Out! Meeting venue hire near Eat Your Heart Out! Where to have your meeting, conference, exhibition, private dining or training course near Eat Your Heart Out!. Riverside Building, Westminster Bridge Road, South Bank, London SE1 | 3 minutes from Eat Your Heart Out! Jubilee Gardens, South Bank, South Bank, London SE1 | 5 minutes from Eat Your Heart Out! Southbank Centre, Belvedere Road, South Bank, London SE1 | 5 minutes from Eat Your Heart Out! Venue Hire near Eat Your Heart Out! Our recommendations in the same street as Eat Your Heart Out! London Dungeon 3 minutes walk from Eat Your Heart Out! The Debating Chamber, County Hall 3 minutes walk from Eat Your Heart Out! Southbank Centre 5 minutes walk from Eat Your Heart Out! Underbelly Festival 5 minutes walk from Eat Your Heart Out! Southbank Centre: Royal Festival Hall 5 minutes walk from Eat Your Heart Out! From cheap budget places to stay to luxury 5 star hotels see our deals for The Vaults hotels, including Park Plaza London Waterloo from 80% off.